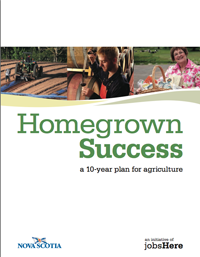 Homegrown Success is government’s 10-year plan for agriculture. It represents a forward-thinking, careful and deliberate shift for government. As part of the jobsHere strategy, the vision and objectives outlined in Homegrown Success are paving the way to greater economic prosperity for the agricultural industry. As the industry works to position itself to better seize the opportunities that come our way in this global and ever-changing economy, government and the agricultural industry agree on the approach that will best support sustainability for Nova Scotia’s agricultural sector. Many factors have prompted various sectors within the agricultural industry to adapt over the years. A dynamic and innovative industry requires government to provide the kind of genuine leadership the industry needs to grow forward. There is still a lot of work ahead, but this plan sets out the future direction for government. Homegrown Success reflects our understanding of the complexities of the industry so that the programs and services we develop allow the industry to thrive. Government and industry share the same objectives: a profitable, competitive, innovative, self-reliant industry, valued for contributing to the economy, the environment and vibrant rural communities. As we move forward, we will make strategic investments in innovation and productivity that increase the competitiveness of our companies and create high-value jobs for Nova Scotians. We look forward to continued collaboration so that industry can pursue successful business models and work to ensure greater competitiveness and profitability for the benefit of all Nova Scotians.